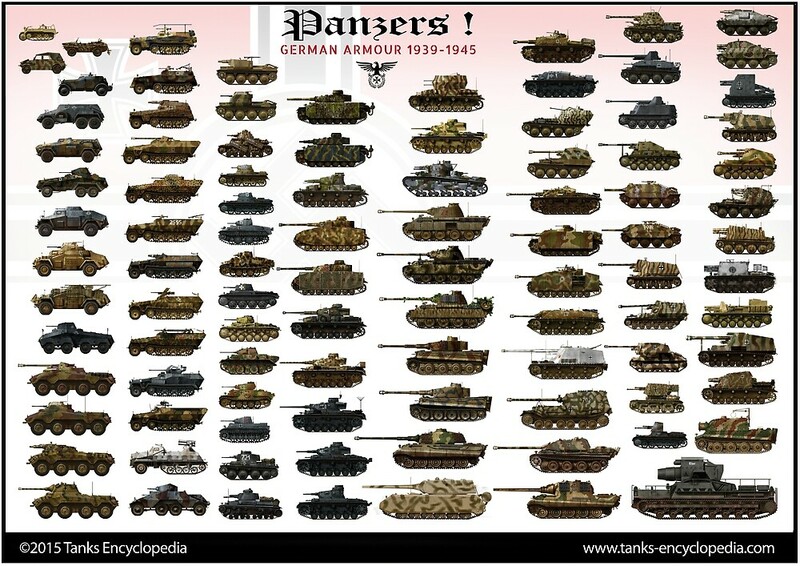 By the time the Western Campaign began in May 1940, there were already eighteen tank-hunters available, all Panzerjäger Is. They were based on the obsolete Panzer I Ausf.B chassis. This vehicle was found quite unsatisfactory regarding crew protection. But its Czech-origin 47 mm (1.85 in) gun performed well against most French light tanks of the day, and even the better-protected B1 bis and SOMUA S35. On the other hand, the Panzer III‘s puny 37 mm (1.46 in) often failed in this respect. But there was still room for improvement. After the fall of France, more than three hundred French Lorraine 37L supply tanks (of an estimated 600) fell into German hands. Some officers did not take long to see the potential of these chassis, which were tested and found particularly reliable and sturdy. Although many Lorraines retained their original supply rôle in German service, others were converted for various other tasks and the most famous and prolific of them all was the Marder I (for “Marten” or Weasel). 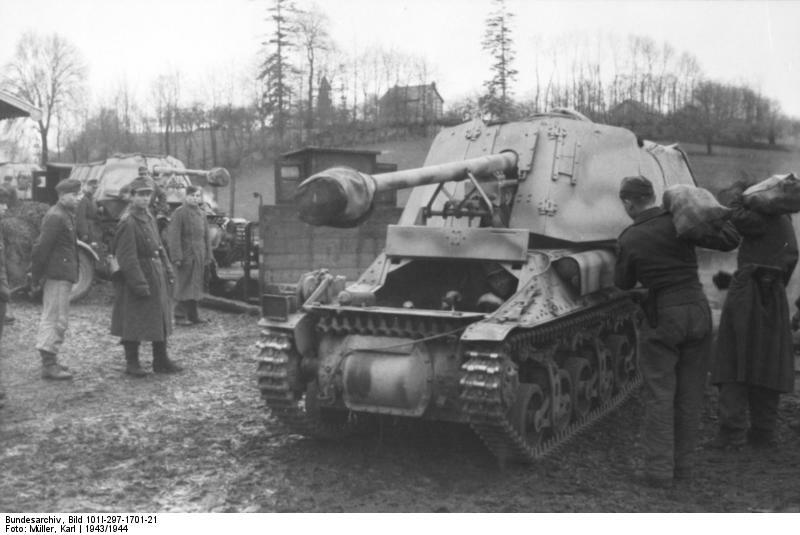 Ordnance name was 7.5 cm Pak 40/1 auf Geschützwagen Lorraine Schlepper (f)/Sd.Kfz.135, Marder I. The Marder I’s history really started a few days into Operation Barbarossa, when some German units saw themselves almost overrun by superior T-34s and KV-1s. Although most Panzer IIIs fielded there had been recently upgunned with the new 50 mm (1.97 in) gun, it was still found insufficient. Also, the bulk of the German army was still made of lighter models, either the Czech-built Panzer 38(t) or the Panzer II. The Panzerjäger I was also inadequate. 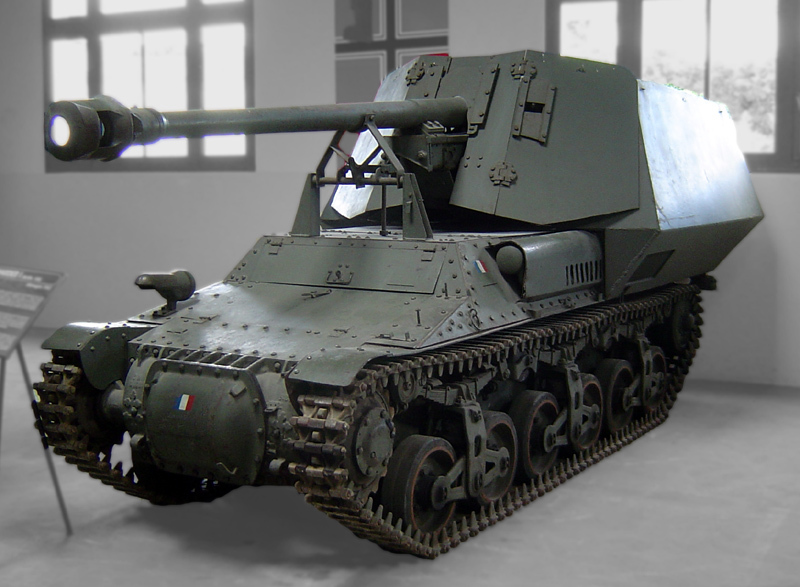 So, a vehicle capable of carrying the best German antitank gun then available, the 75 mm (2.95 in) Pak 40, was urgently needed. One solution was to convert 170 of the already available Lorraine 37L chassis to carry them. The idea was put into practice in May 1942 by Major Alfred Becker. Becker devised a testing workshop, called “Baukommando Becker”, to modify one chassis in order to carry a Pak 40 with all its undercarriage removed. To make room for the gun, most of the upper superstructure of the Lorraine chassis was modified. A thin 10 mm (0.39 in) armored casemate was then mounted behind the gun, open at the rear and above, only protecting against shrapnel and small arms fire. The gun was placed in the center and its original shield was kept, in order to obtain extra frontal protection and to speed up conversion. The light and narrow chassis was lightly armored itself, so overall protection was poor. Due to this, and working in conjunction with Alkett, the production of 170 of these self-propelled guns was over in two months, between July and August 1942. Baukommando Becker also performed conversions of Hotchkiss H39s and FCM 36s chassis in smaller numbers. The Marder I was given to tank-hunter units attached to each division on the Eastern Front. These units were the Pz.Jg.Abt.31, Jg.Abt.35, Jg.Abt.38, Pz.Jg.Abt.72, Jg.Schn. Abt.206 and Schnelle-Abt.256. The later was the last to operate, until total destruction in April 1944. 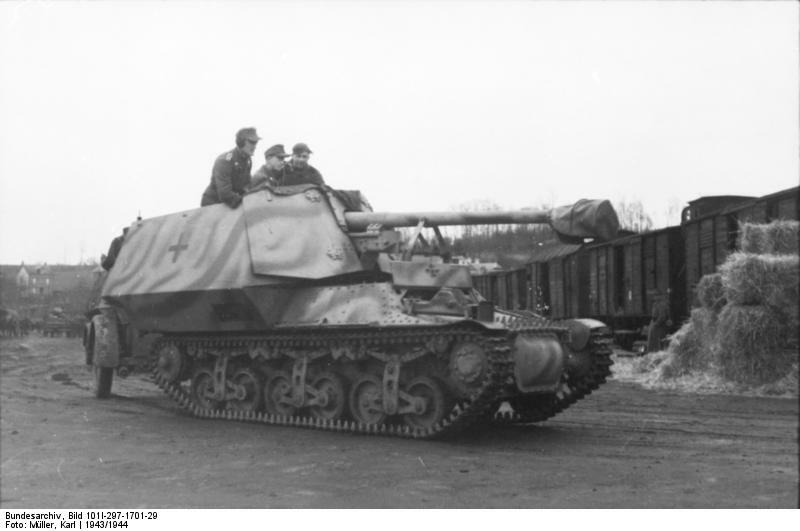 By December 1943 or early 1944, most Marder Is had been either destroyed, and those surviving were gradually replaced by the Marder II, III and StuG III late versions. 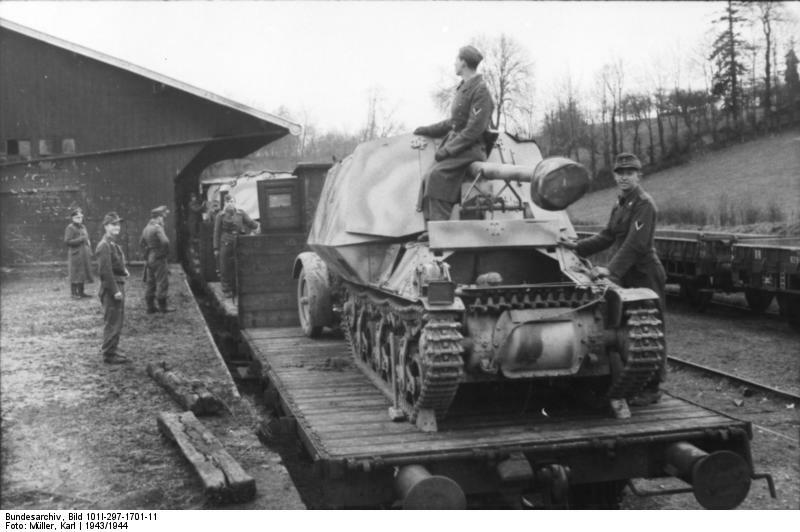 The Marder I was judged satisfactory in 1942, but since it was more of an SPG rather than a pure fighting tank hunter, losses were high until better tactics were used. The remainder were shipped back to France and then operated with Rommel’s 21st Panzer Division operating in Normandy during the crucial summer of 1944. S.Hart mentions that 131 Marder Is (including those built on the H39 and FCM 36 chassis) were still being used in France on January 1, 1944. These were generally operated in five tank-hunter batteries. Marder I on the Eastern Front, winter 1942-43. 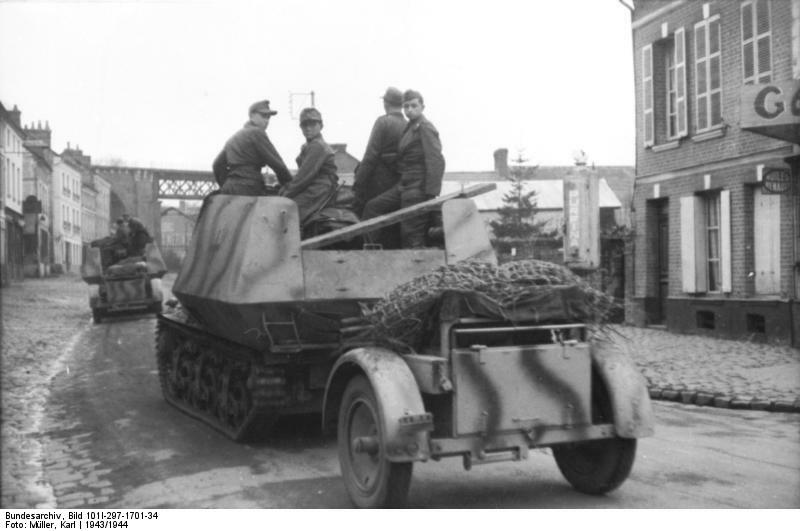 7.5cm Pak 40/1 auf Geschutzwagen Lorraine Schlepper(f) Sd.Kfz.135 – Normandy, 1944. Marder I in France, September 1944. Notice the camouflage nets. Your site is a great reference tool. Keep up the good work. There is no catch, no charge, free. I took 99.9% of the photos. I try to show people where to find restored WW1 and WW2 tanks. is there not a section for Marder 3(M),?? The Marder III variants will be added sooner to the website! Have patience! One of my favourite reference sites out there. Keep up the excellent work. hi, great job on this website ! Most of them seems to be broken, since the owner made some organisation changes. Hi Eldrak, that was a typo, thanks for spotting it. The link was corrected also.